UPGRADED 42 LED SOLAR FLAGPOLE LIGHT provides more brighter & wider coverage lighting performance than others 30 LED or 26 LED to display your flag more proudly! IMPROVED ELEGANT 6 BIGGER SOLAR PANEL convert more sun light into electricity energy to be stored in a 18650 rechargeable battery (VS. others 3x AA batteries) for show time! AUTO ON AT DUSK & OFF AT DAWN, just be sure to turn the light ON via the ON/OFF button before installation. 2 brightness level makes it can be used as a camping light with included hook. LARGE CAPACITY 2400mAh 18650 BATTERY (VS. others 2200mAh) for 42 super bright energy efficient SMD LED bulbs, working time up to 10+ hours at night after a full sunny day of charge. APPLY TO MOST OF FLAGPOLES (through hole for 0.5”), the independent solar charging system makes it easy and simple to install without special tools. No hassling with wires and electrical connections. BYBLIGHT Latest Version 42 SMD LEDs Solar Flagpole Light Facilitate Old Glory Once More and Display Pride Flagpole. 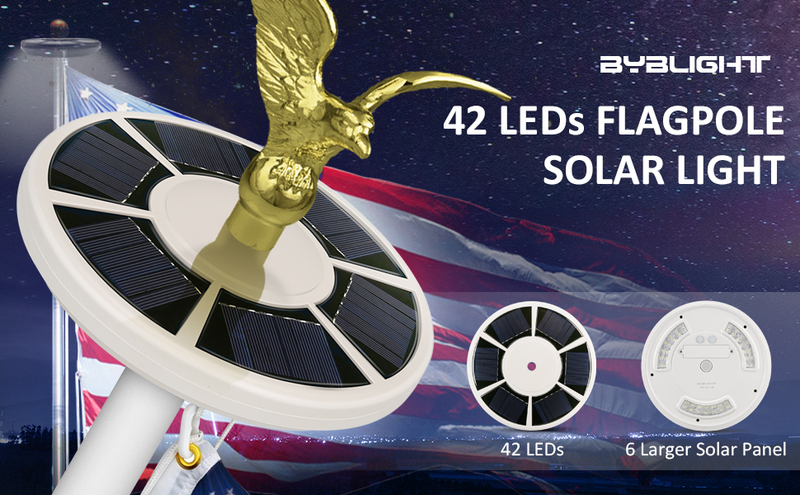 BYBLIGHT Solar Flag Light will always illuminate The Star-Spangled Banner waving over the land of freedom and home of brave. 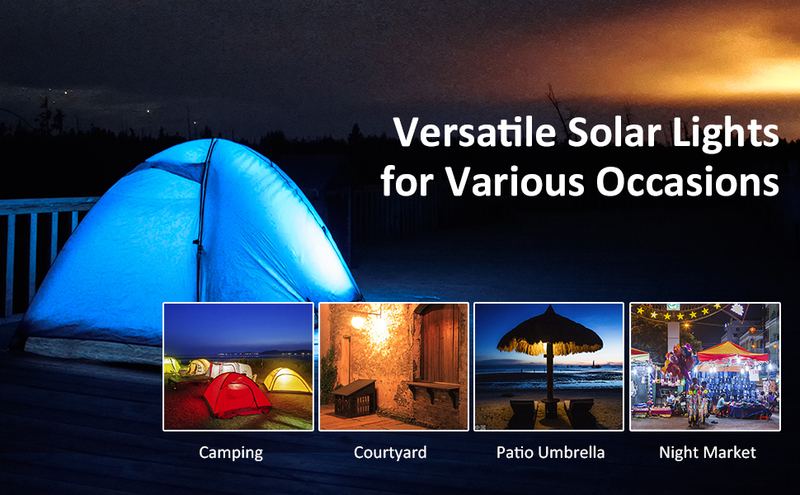 Larger 6 solar panel would capture maximum amount of sunlight to convert enough power for this solar flag light. Comes with a 2400mAh 18650 rechargeable battery is energy saving and environmental protection take full sunny day to full charge. Not only a flagpole light, featured hook can hang on the solar light and make it used be a camping light. MIN. Length of Ornament Shaft or Rigged Bold required to go through our light: 1.75"
Width of hole to fit through ornament shaft or rigged bolt: 0.5"
Please remove the film on the solar panel and push the switch to ON before using. Be sure to turn the light "ON" via the ON/OFF button before installation. Keep the solar panel clearn and locate where it can get sunlight maximum. Exercise caution when replacing battery, Screw the battery cover to replace the old battery with a new one. Battery must be recycled or disposed of properly, don't dispose battery in fire or trash. Contact your town or city's recycling center to find out how to properly dispose battery.